The portrait of the front side of 1000 Japanese yen note shows Hideyo Noguchi, a bacteriologist who devoted himself to yellow fever research. The reverse depicts Mount Fuji and cherry blossoms. A security feature unique to the new 1000 yen note. 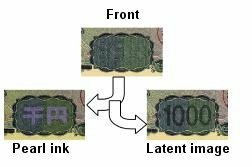 When the banknote is tilted, you can see (1) the Japanese characters meaning "1000 yen" printed with pearl ink, and (2) the number "1000" as a latent image. 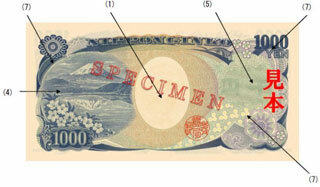 When the banknote is held up to the light, a vertical watermark bar (three bars for the 10000 yen note, two for the 5000 yen note) becomes visible. This feature is more difficult to reproduce with personal computers or color copiers than the traditional watermark. 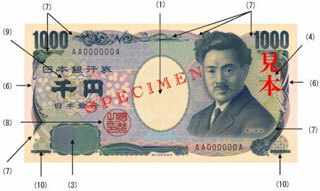 Raised printing is used for some features of the new 1000 yen note. The ink on the new note is raised higher than the ink on the current note.